If you have followed my blog, I recently refuted a blog by Rosa Rubicondior. 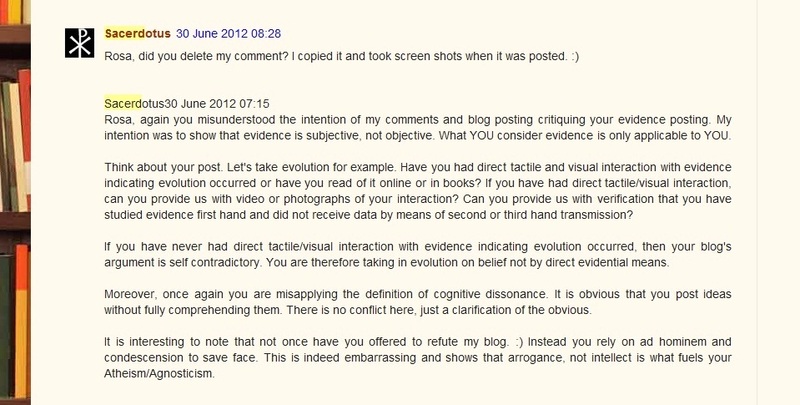 (http://sacerdotvs.blogspot.com/2012/06/rosa-rubicondior-evidence-gaffe.html) As usual, Rosa attempted to argue back but with ad hominem and condescension. Rosa attacks attacks and attacks, not my points, but me! As expected, Rosa did delete the original comment as well as this one. They were deleted. It is understandable why Rosa would delete them. They expose the intellectual dishonesty that composes Rosa's blog. What is also troubling is Rosa's constant request for proof of God when I never offered to do such a thing. My only intent was to refute Rosa's claims. 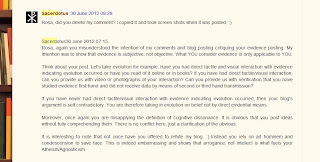 Rosa's own blog post does not request proof but rather shows what constitutes evidence for God, according to Rosa. Rosa apparently has issue comprehending what is read. Notice that I answer Rosa's claim that I some how ran away from providing evidence. Refuting a blog about what constitutes evidence does not mean providing evidence for God. Such a pity you couldn't support that claim with an actual example of you doing so here, eh? BTW, there was nothing to debunk. It is a challenge - which you manifestly failed. Did you not actually read what you were commenting upon? Your claim is, of course a lie. Your challenge was to provide the evidence which meets the above criteria and so will convert an atheist. Your blog merely gives your excuse for not being able to do so, as people can see should they go to your blog at http://sacerdotvs.blogspot.com/2012/06/rosa-rubicondior-evidence-gaffe.html. For example "Atheists will always demand "evidence" for the claims of believers; however, they will never provide evidence for their counter argument." 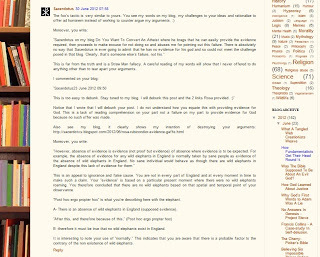 From previous experience of your 'debating' style I am not at all surprised to see you again trying the intellectually dishonest and cowardly ploy of trying to divest yourself of the responsibility for substantiating your claim of the existence of your god and demanding that atheists disprove it instead. This is, as you probably know, an example of one of the more dishonest debating ploys - the False Dichotomy Fallacy - and as such illustrates both your moral and scientific bankruptcy. It is so blatant that it is normally only ever attempted by people who know their claim is a lie or who lack the intellect and integrity to realise that they have been fooled by it themself. Since you employ very little else as a debating tactic, I assume you are trying to fool people into agreeing with you in the belief that, should you succeed, it will turn the lie you know you are pushing into a truth. Thank you for showing once again the close link between intellectual dishonesty and God Delusion. Since very many people are now freeing themselves from religious delusion and regaining their intellectual integrity, it looks like religion causes dishonesty rather than dishonesty causing religion but then when you are too afraid to not follow the herd but know you are living a lie, what other option do you have but to pretend, even to yourself? By the way, I have put a comment on your blog. I wait to see if you have the integrity to allow it through. As usual, you resort to Ad hominem. Instead of attacking the arguments, you attack the arguer. This is common among Agnostics/Atheists such as yourself who do not have the intellectual confidence to articulately construct a rebuttal. They attack the arguer and falsely throw around fallacy accusations in order to save face. Moreover, you erroneously make charges of False Dichotomy. No such attempt was made to force anyone to accept a position. A False Dichotomy is when one is not of A then one is of B. Any well read person would see that my blog post has no such content. It is merely a commentary of your blog and why it is irrational. To date, you have not provided any evidence supporting your counter argument that my blog post is "bankrupt." Until you do so, your ad hominem comments proudly display your defeat. PS. I have no problem posting comments as long as they are not vulgar, hateful, and they pertain to the discussion. If you don't like your lies being publicly pointed out, try not lying. I appreciate you wouldn't win any arguments with it but you can't imagine you're actually winning any with your present tactics, can you? Maybe you don't know what a false dichotomy is. It's where you don't offer any evidence for your claim but just attack your opponents argument. It relies on your audience being gullible, parochial and stupid enough to think your god is the only alternative on offer. I can't speak for your normal audience, and maybe your obvious contempt for their intelligence is justified, but I wish you wouldn't insult the readers of this blog with that condescending assumption. They will, of course, have noticed that you don't have any evidence for your god - which is why you know you need to use dishonest tactics in the first place. Will you have the courage to take the challenge in this blog soon, or are we to be treated to lots more excuses for not doing so, coupled with more abuse and dishonest tactics in an attempt to divert attention from your abject failure? Rosa, by your own definition you are guilty of false dichotomy. I do not see any evidence for the claims you make here. However, your understanding of the False Dichotomy fallacy is incorrect. A False Dichotomy deals with an "Either/Or" argument. First: Propositions made are reciprocal to one another. Furthermore, my comments were not about providing evidence for anything, rather, they are a critique of your nonsensical post. Someone retweeted your tweet and I saw this "evidence" blog link you were advertising and laughed at it as I read it because it holds no ground as I have demonstrated on my own blog. I then decided to write on it so others can see how you and kaimatai proposed ideas that have no weight to them. Had the person not retweeted your tweet, I would not have seen it due to your cowardice act of blocking me after I proved myself to be an opponent you could not deal with intellectually last year. Rosa, with all due respect, your blog offers no challenge. Your blogs repackage the same misconceptions and lack of knowledge on Scripture and Christianity that Atheists and Agnostics have demonstrated throughout the centuries. You quote Biblical passages as if you've discovered some strange thing about each that no one else has. Your misconceptions have answers. Whether you accept them or not is another issue. 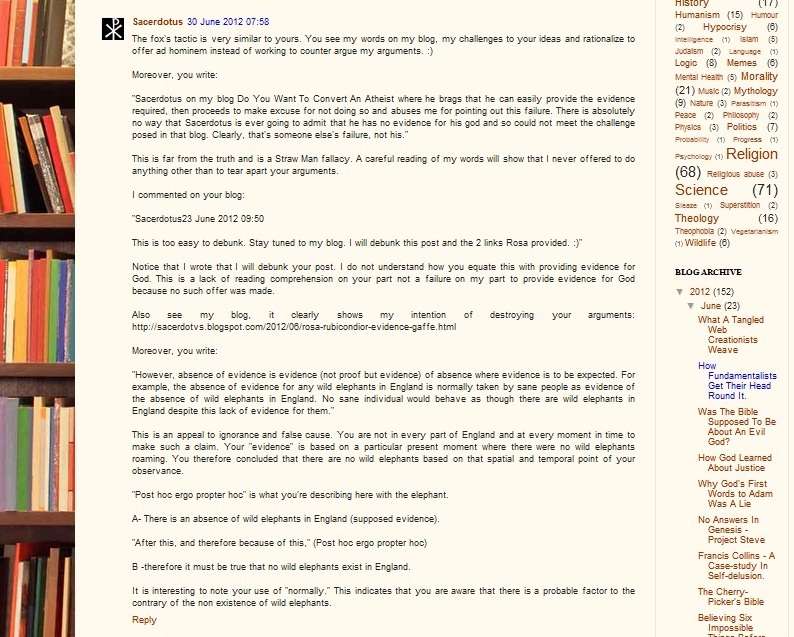 It seems to me that your blog is your way of indirectly asking questions regarding religion. I think behind that "atheist/agnostic" facade is a curious person looking to learn about God, Scripture and Faith. This seems to be very common I have noticed. So we are to have long rambling excuses, ad hominem abuse and attempts to divert the conversation rather than dealing with your abject inability to meet my simple challenge then, eh? Don't you ever feel any shame or embarrassment at having to abandon personal integrity so spectacularly and publicly to defend your infantile superstition and give yourself an excuse to condescend to people and to try to control them through fear and ignorance? By the way, your dishonest and intellectually bankrupt use of the false dichotomy fallacy is exactly as you describe. You attack science but never provide any evidence to support your own claim in the hope that your victims will be gullible, stupid and parochial enough to assume your imaginary friend is the only alternative on offer, just as I described. It should be obvious to anyone why you need to use this tactic. Now you have revealed that you understand the deception fully, we can exclude ignorance or you having been fooled by it yourself from the possible reasons you use it. So that just leaves dishonesty as the reason. Thank you for clarifying that for me. Attack science?? nooo wayyy Did you not read Sacerdotus' blog? He owned you RosaRubicondior. Your blog has no credibility at all. I would love to debate Sacerdotus some time. Please read my email I sent you if you see this comment! You 'forgot' to say how, exactly. Did you hope no one would notice? You also 'forgot' to give your name. I wonder if people can work out why. There was, of course, no email. Did you realise it would reveal your identity? Sacerdotus. I have used your contribution here to illustrate my blog on cognitive dissonance (How Fundamentalists Get Their Head Round It) as it is an almost perfect example of a coping strategy for the problem of needing to believe your 'faith' has an evidential basis whilst being unable to find any. You merely assert there is some which you could produce if you wished, then try to shift the blame onto the person who points out that you have none. It also neatly illustrates another point in that blog - how fundamentalist are often so preoccupied with coping with cognitive dissonance that they trample roughshod over the very 'faith' they are trying desperately to cling to. The fact that you deleted my comment shows you have failed and lost. :) Moreover, you do not attack my points but instead attack me. Nevertheless, I took screen shots and will post on my blog showing the world the dishonesty you represent and the fear you have of engaging someone who has corrected you on countless occasions. Thank you for showing the world that Atheism is irrational and cannot be defended.